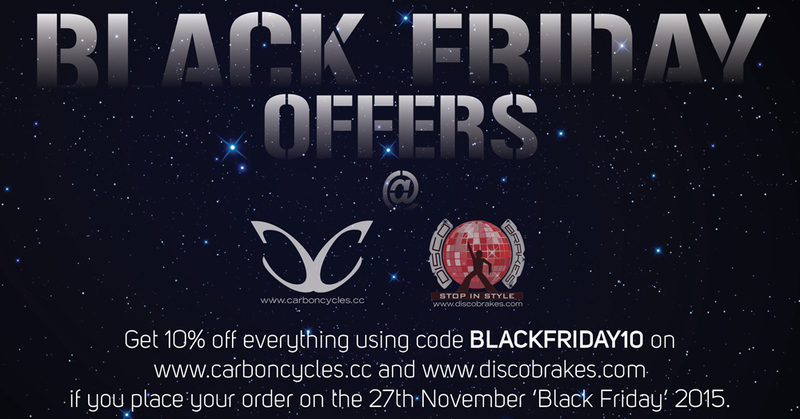 On Friday the 27th November 2015 get 10% off everything on www.discobrakes.com and www.carboncycles.cc by using voucher code BLACKFRIDAY10 at checkout. See T&C’s below. •	Vouchers can only be redeemed on www.discobrakes.com (for Discobrakes promotions) and www.carboncycles.cc (for Carboncycles promotions). •	Only one voucher per order. •	Minimum spend required (exclusive of any shipping costs). •	Discobrakes and Carboncycles reserve the right to end promotions at any time. •	Discount vouchers & promotions are only redeemable against in-stock items. •	Orders for out of stock items cannot be accepted. •	Discount vouchers/promotions cannot be used in conjunction with any other voucher offer. •	These codes are single use per account. •	Discount vouchers/promotions cannot be applied retrospectively.